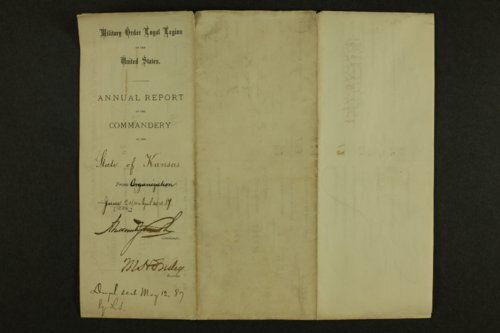 These documents are annual financial reports and monthly membership reports from the Kansas Commandery of the Military Order of the Loyal Legion. Also included are receipts, membership materials, and speeches. The Military Order of the Loyal Legion of the United States (MOLLUS) was organized in 1865 following the death of Abraham Lincoln and the conclusion of the Civil War. It was a fraternal organization primarily composed of veterans and hereditary members to memorialize the events of the Civil War.